Is your faith community looking for a meaningful way to reach out to developing nations? Do you want to honor a loved one by giving a gift of life? Interfaith Power and Light’s Carbon Covenant program helps communities in the Global South work to reverse deforestation and build sustainable livelihoods. Hundreds of individuals have pitched in, donating from $5 to $1,500, but organizations can have an even greater impact. 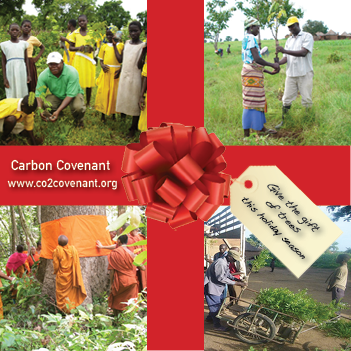 With your help, Carbon Covenant has paid out tens of thousands of dollars to the following programs. You congregation can form a carbon covenant by choosing to support a specific program, or all of them. Learn how to help Monks save a large community forest in Cambodia, or stop dessertification in Cameroon, support the restoration of deforested land in Ghana, or help those who are trying to plant 3,000,000 trees on Kilimanjaro.